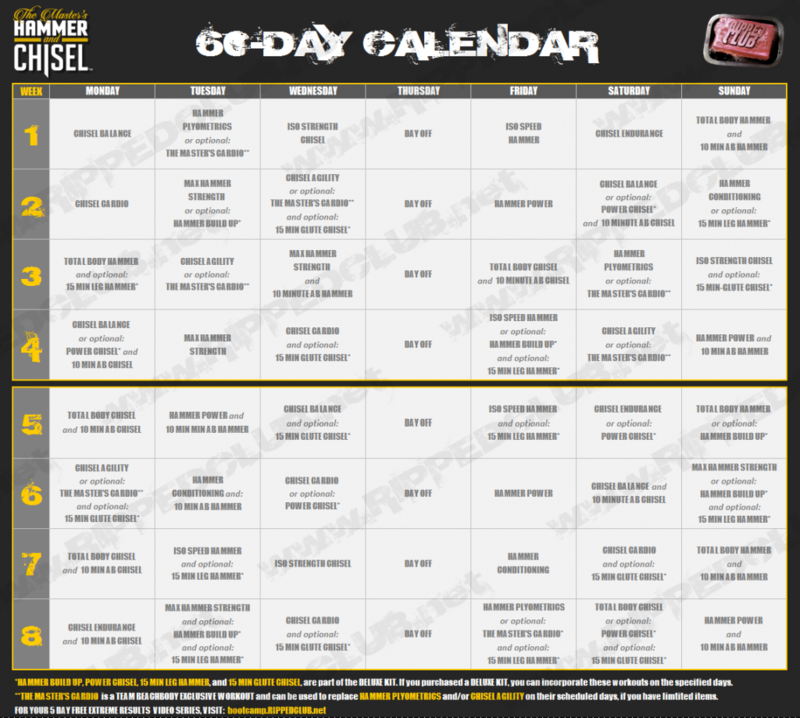 The Hammer & Chisel workout calendar is the product of two literal MASTERS of fitness. What your going to see in this schedule is the expertise of Sagi Kalev and his dynamic set training that you saw in Body Beast, but fine tuned to attack every muscle you dont think about. The Hammer and Chisel calendar is a detailed resistance training system that incorporates three muscle sculpting phases: Stabilization, Strength, and Power. Together, these three phases form SSP Training. 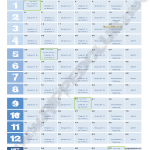 What you’re going to see below is a free downloadable version of the H&C workout calendar that you can print off and mark up at your liberty. Just dont get too much blood and sweat on it, lol. What if I dont have the Hammer & Chisel workout yet? If you have not ordered Hammer & Chisel yet, I highly recommend that you take advantage of the saving you get when you order the Hammer & Chisel Challenge Pack. FITNESS + NUTRITION + SUPPORT + REWARDS = RESULTS CITY!!! …And thats exactly what you get with the challenge pack. After you order, be sure to contact me so that you can claim your free BONUS where I can place you in one of our exclusive “RIPPEDCLUB member only” Facebook accountability groups! These groups are taking our team’s results to a whole new level! Below is a list of each workout and how long it lasts with around 12 minutes being the shortest and 43 minutes being the longest workout. In addition to workout length, below you can find a description of each workout! Chisel Balance A total-body workout creating stabilization, muscular endurance, and core strength. Iso Strength Chisel An intense resistance workout using isometric holds and flexibility to increase strength. Chisel Cardio The cardiovascular resistance routine will increase heart rate, circulation, and burn an intense amount of calories. Chisel Agility A challenging cardio workout that will help you move quickly, improve coordination, and create greater stabilization. Hammer Plyometrics This jump training workout will use your entire body to create force, speed, and power. Iso Speed Hammer A tempo training workout that uses speed and isometric holds to create strength and grow muscle. Total Body Hammer A hypertrophy workout focused on pyramid-style sets to maximize strength and muscle growth. Max Hammer Strength Start with a pre-fatigued muscle, finish with a maximum lift. Increase strength, power, and muscular development. Hammer Power This intense powerlifting-inspired workout will increase speed, reactive strength, and power. Hammer Conditioning A workout based on compound movements that will improve stability, coordination, and strength. 10 Min Ab Chisel This core-crusher will transform your midsection, without ever getting on the floor. 10 Min Ab Hammer Carve definition into your core while strengthening your entire ab complex. REQUIRED EQUIPMENT: Dumbbells, workout bench OR stability ball, chin-up bar OR resistance band with door attachment (not included in base kit). RECOMMENDED EQUIPMENT: Yoga Mat or Beachbody Core Comfort Mat are helpful but not required. Anyone looking for a comprehensive resistance-training or muscle-sculpting program. Those who enjoy Body Beast, 21 Day Fix, or 21 Day Fix EXTREME and like the motivating styles and proven training methods of trainers Sagi Kalev and Autumn Calabrese. Anyone who craves a simple, flexible nutrition plan to help them reach their unique goals. What is the difference between The Master’s Hammer and Chisel and 21 Day Fix EXTREME/Body Beast? PS – After you have downloaded your Hammer & Chisel workout schedule, when you CLICK HERE for my free 5 day bootcamp – I am going to show you my step-by-step method I used to drop 60lbs and get absolutely ripped!